Beirut, Lebanon: Beirut Boat Show, Lebanon’s only International Yachting and Luxury show returns this spring for a grand exposition blending supreme luxury with exciting outdoor activities. When it comes to marine luxury living, Lebanon has made great strides in recent years with several high-end developments popping up on the seafront along the shoreline. The country is the hub for luxury with a strong portfolio of high-end designer creations and international labels to compliment the wealth and cachet of privileged customers. 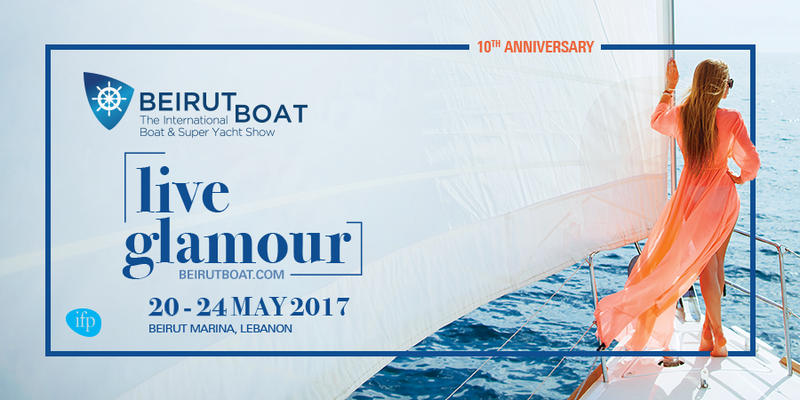 Organized by IFP Group (International Fairs and Promotions), the 10th anniversary edition of Beirut Boat Show will be held under the High Patronage of His Excellency the President, General Michel Aoun, from 20 to 24 May 2017, at the prestigious Beirut Marina, in the heart of the capital. The Beirut Boat Show event will feature an exquisite superyacht display and will host some of the most renowned international yachting companies, superyacht builders and designers, nautical suppliers, brokerage houses and refit shipyards. This year, the show is extending its luxury motif beyond boating and is setting up specialized exhibition areas to capture the essence of high living in all its facets. Combining high-end luxury, flamboyant lifestyle, and outdoor entertainment, the show is expected to attract over 20,000 maritime enthusiasts, elite society figures, lifestyle gurus, VIPs, and high-earning individuals.